the little red house: twins!!! post edit: AAAAAAAHHHH!!!! It just happened again!!! Twice in a row....what??!!! i think it happens way more often with organic, free-range eggs. at least it seems that way to me...have you ever had a pregnant pepper? that's a fun one, too. i've got a picture somewhere, i'll have to dig it up. that's weird...and sad. i don't know if i could eat it! and a pregnant pepper? i would love to see that! haha! i literally laughed out loud at the post edit. i saw pics/read of a woman whose ENTIRE DOZEN was twins. so i guess it was two dozen. Liz! I've totally had a preggo pepper before too...so weird!! I couldn't eat these eggs. I just imagined the cutest little twin chicks and I couldn't. Plus, I have twin nephews.....it didn't feel right. i've totally had a pregnant pepper. the little guy inside is just so cute! Ahaha! Why is that weird? But it is! happens pretty often with farm fresh eggs...no biggie. Eeek! That just freaks me out!!! Not a huge fan of eggs to begin with, so I am totally creeped out now hehe! I've had that happen to me, I usually just scramble it up anyway...organic eggs are so expensive! And pregnant peppers, that always makes me laugh, it's such a cute little surprise! That's pretty common for us. We have about 30 chickens that lay eggs and very often we get "double yolkers." 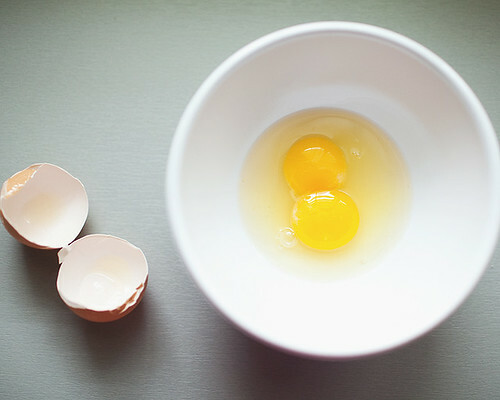 When we were kids we would fight over who would get the double yolked egg. You can't always tell but sometimes the egg is really big and you can be sure it will have two yolks in it. There is nothing to fear from a double yolker - it's safe. can't believe this. i'm a twin. i would feel weird about it too. SOOOO weird. I don't know if I could eat them...but I think I would have to, because I would feel bad just wasting them. I've heard all this excitement about a pregnant pepper and feel a bit left out...maybe someday. 2 for 1 - you should be "egg"cited! If that happened at Target and you got two of something you loved for the price of 1 it would be "egg"cellent! K - I'm done! I'm "egg"stactic to see you super soon! this happened to me yesterday! Twice in a row too! I couldnt believe it :) I've never i my life had twins...TWO sets of twins!